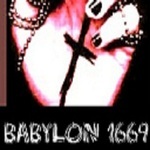 Sign up for Broadjam today to follow Babylon1669, and be notified when they upload new stuff or update their news! I saw a woman sit upon a scarlet coloured beast, full of names of blasphemy, having seven heads and ten horns. And the woman was arrayed in purple and scarlet colour, and decked with gold and precious stones and pearls, having a golden cup in her hand full of abominations and filthiness of her fornication: And upon her forehead was a name written, Mystery, Babylon the Great, the mother of harlots and abominations of the earth. And I saw the woman drunken with the blood of the saints, and with the blood of the martyrs of Jesus: and when I saw her, I wondered with great admiration."